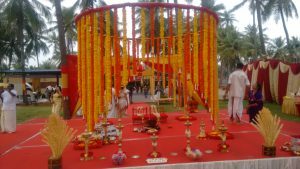 Wedding Decoration a.k.a Stage decoration / Flower decoration are some of the frequently used buzz words for wedding decoration. Based on the above factor narrow down to a list of decorations that would match. As a wedding planner we will suggest some creative ways to do the wedding decoration for every event and recommend the same. Give special focus on the bride and groom dress since they should stand out always. There are lot of new themes like leafs , seed and fruit, only jasmine, bamboos/leaves / flowers/drapes. We can also do specific replication of any location /temple / place etc based on the budget. Make sure to book the venue for the required time for wedding decoration . This is something very much required for the dream wedding decoration to happen in the way you have decided. You can talk to us at 9841079573 to know more .. 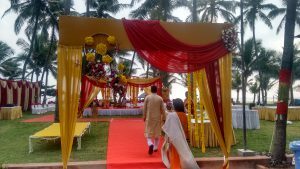 Yes of course wedding decoration depends on the venue chosen by the bride and the groom. And therefore the flowers must be selected according to venue by the bride and groom. If one is using flowers in decoration so he can use flower frames for clicking photos of bride and groom which will be unique.